"It's a good buy, as I felt like a teacher was right there with me." Adobe Dreamweaver CS4 Digital Classroom book with DVD is like having a personal instructor guiding you through each lesson, while you work at your own pace. 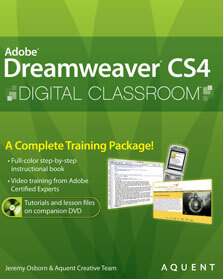 This Dreamweaver CS4 book with DVD includes 14 self-paced lessons helping you learn essential skills and explore new features and capabilities of Adobe Dreamweaver. What’s new in Dreamweaver CS4?